China – September, 2011 - Dymek receives EVG full automatic mask aligner order from top LED manufacturer in China. 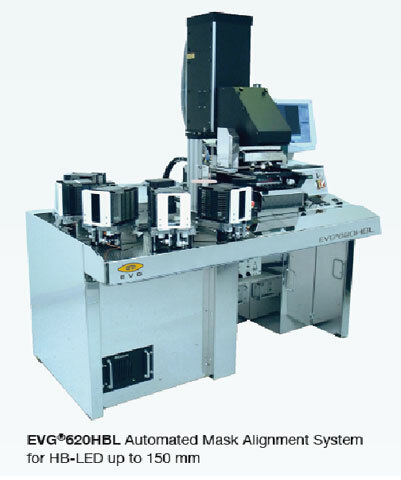 The EVG®620HBL is a dedicated, fully automated mask aligner system for high volume manufacturing of High-Brightness LEDs (HB-LEDs), compound semiconductors and power electronics. Based on the highly successful and –eld-proven EVG®620, the HBL-version is optimized for lowest cost-of-ownership and highest yield in compound semiconductor manufacturing. Continuous processing of up to 165 wafers, highest alignment accuracy and the capability to handle bowed, warped and transparent substrates such as sapphire, SiC, AlN, metallic or ceramic substrates with sizes up to 150 mm make the EVG®620HBL the perfect solution for high volume manufacturing of HB-LEDs and compound semiconductors. The installation has finished in Sep. 2011.